On August 20 around 1pm, Harrison Police received a call about a stolen truck from 900 S Second St. Ptl. Darren Raefski met with the complainant and learned the truck, a brand new 2016 Freightliner (straight-job) was stolen from the front of the building. Apparently the driver and a helper had just unloaded items to a warehouse and it was still running. They saw a male jump in and drive away with the truck. The immediately contacted the police and accessed a system to track the truck because it was equipped with a GPS device. The system indicated that the truck only drove a few miles and had stopped near the area of MLK Blvd and William St in Newark. Officer Raefski began to respond to that location while the victim and a helper followed in their own vehicle while coordinating with our dispatch center. Newark PD was also contacted for assistance but had units allocated to another job. As they arrived at the location of the truck, Officer Raefski approached the driver’s door and pulled it open. He ordered the suspect out of the truck, but the driver quickly put the truck in drive and started to move with Officer Raefski standing on the running boards. Officer Raefski struggled with the suspect to hit the brake while also trying to remove the suspect from the vehicle. He was able to get one handcuff on the suspect and force him out of the truck. He immediately received assistance from the two victims who had also reached the truck. They helped him subdue and handcuff the suspect, and place the truck in park. No one was injured and the no property damage resulted. The suspect, Kevin Hobbs, 48 of Newark, was arrested and charged with theft of a motor vehicle. 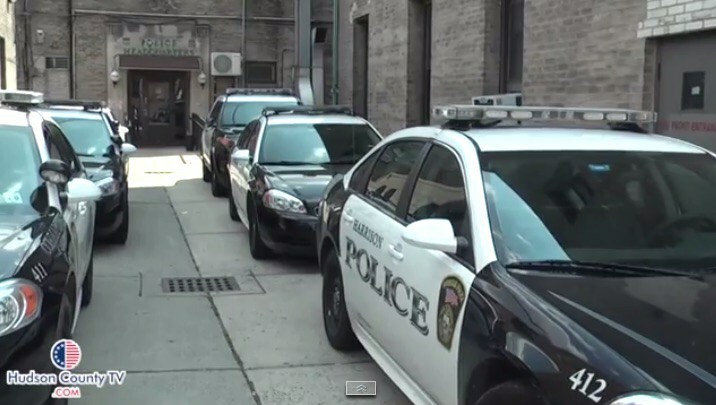 He was also found to have warrants from Newark, Jersey City and Hillside for various crimes totaling over $4,500. His bail was set at $75,000 (no 10% option) by Judge Lindenfelser. He was held at the Hudson County Jail.